The Nikon COOLSHOT AS Laser Rangefinder belongs to the legendary family of Nikon and is a high performing distance measurement rangefinder appointed with advanced technologies. This device is a compact, lightweight perfect golf rangefinder with impressive features and functionality. It is simple to use yet gives you accurate results whether its straight line, up the hill or down the hill target distances. The device stands as a great combination of optical performance along with use of some new advanced techniques for improved results. Why Nikon COOLSHOT AS Laser Rangefinder? 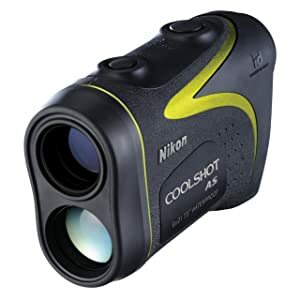 Using Nikon COOLSHOT AS Laser Rangefinder gives users a lot more benefits in comparison to its competitors’ rangefinder. The size and weight of this device makes it easily portable and you can take it anywhere along with you in your pockets or in your golf bag. Operating this rangefinder is quite easy as it has a one button operation. Apart from that it has a wide field of view and long eye relief that proves comfortable for users. The COOLSHOT AS is highly durable and offers accuracy and speed of operation that you may not find with other devices in same range. This device would surely aid in making you a good golfer as it gives accurate target distances and you can now make more accurate shots even with facing obstacles. This device stands as a leader as it is backed by a reputed name Nikon well known in industry for optical precision. While using this Nikon rangefinder, it is certain that you will be able to lower your score and make your play better and more confident. The Nikon COOLSHOT AS Laser Rangefinder follows the same multi-layer coating pattern for optics as the Nikon ACULON AL11 Laser Rangefinder. You get improved visibility through high light transmittance. With these coatings, user can enjoy a natural view. The COOLSHOT AS has large 18 millimeter ocular that enables a quick view. It works faster with taking measurements and thus fastens up your play as you can make more shots with confidence. Wider fields of view along with long eye relief are other important features of this device adding to comfortable usage. The design of the body is ergonomically friendly. This compact device has dimensions 4.4 x 1.5 x 2.8 inches and a light weight of 6.2 ounces. You can even use it in bad weather conditions as this product is completely waterproof. Nikon backs this rangefinder with a 2 year warranty. The Nikon COOLSHOT AS Laser Rangefinder is appointed with the new Golf Mode with advanced ID Technology (Incline/Decline). This feature empowers golfers to have complete information of slope adjusted distance whether it is up the hill or down the hill shot. This impressive technology provides accurate angle-compensated distance with the help of which you can choose the right club for your shot and hit the ball with proper trajectory. Nikon’s locking on the Pin technology allows for scanning through the backdrop of the green till a pin yardage or a flag measurement displays closer information of distance. By pressing a single button of this device, you can get continuous ranging measurements for around 8 seconds. You need not to worry about hand shaking interference effect for measurement of pin distance with the COOLSHOT AS. The Tru Target technology here gives you opportunity to choose the closest or farthest target among a group of ranged targets. The device is capable of giving you measurements to a range of 600 yards with an incremental reading displayed of 1/2 a yard. Golfers can get a 6 times magnification with this rangefinder along with an objective armature of 21 mm. You will be able to view your target 6 times closer with this device and would be able to play with more assurance. Other than having a sleek design and accuracy in performance, the Nikon COOLSHOT AS Laser Rangefinder is really simple to use. With just push of one button, you can get instantaneous ranging distances readings. All the distances are displayed with clarity and the display screen is easy to read. Not only this device is easy to use during play but it also works as an amazing training tool. You can learn your own distances while practicing with different clubs. You can get yourself trained with the accurate information displayed through this device and thus can easily avoid big numbers to achieve a lower score over the golf course. The Nikon COOLSHOT AS takes power from one CR2 Lithium battery. Multilayer coating of optics that gives enhanced visibility of target. Accuracy range up to 600 yards. The advanced technology of this device gives you accurate location of pin. You can choose having the closest reading or the farthest in a group of measurements. Golf Mode appointed with ID Incline/Decline technology provides accurate slope distance reading for uneven surfaces. Single button operation makes this device easy to use. It gives you continuous measurements for 8 seconds. Long eye relied and wide field of view helps you make more shots with ease. It is a light weight rangefinder and quite convenient to carry. Display screen gives accurate measurements and is easy to read. It has 6 times magnification capability for targets. Not only it is a rangefinder but is also a learning tool. Slope distance measurement makes it illegal for use in tournaments. Design and implementation of the battery cover is not up to the mark. It is difficult to use. The Nikon COOLSHOT AS Laser Rangefinder is a nice easy to use and convenient light weight small size rangefinder for golfers. It surely benefits your play with the amazing features it has. This device would speed up your game and would surely improve your shots giving you a lower score. It works well in all weather conditions. To buy this golf rangefinder, visit Amazon and avail a good discount with free shipping.